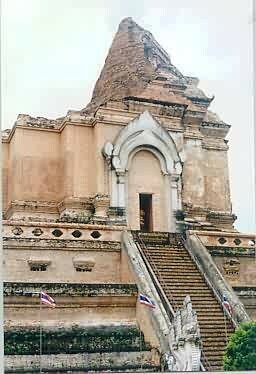 King Saen Muang Ma began building the Phra Chedi Luang to enshrine the relics of his father at the end of the 14th century, but King Tilokarat completed it. At one point the chedi was 144 feet wide and 282 feet tall. Unfortunately, the pagoda was heavily damaged in the 1545 earthquake during the reign of Queen Mahadevi. It was to remain the tallest structure in Chiang Mai for over 500 years. The present restored chedi is about 60 meters high.